HIV uses structures that are called Envelope spikes on its surface to enter target cells, a process that’s intercepted by antibodies, molecules the immune system makes to defend against pathogens. This interception of infection by antibodies is called neutralization. Researchers have in recent years found dozens of so-called broadly neutralizing antibodies (bNAbs) in chronically HIV-infected people that can neutralize many, if not most, HIV strains at very low concentrations. Their goal now is to develop a vaccine that can bring the immune system to make such bNAbs. One challenge is that many HIV variants are much more resistant to antibodies than other, sensitive ones. The reason for this has been unclear—but researchers have now found a tiny change in the Envelope protein that can make simian immunodeficiency virus (SIV), the monkey version of HIV, more resistant to neutralization by some antibodies (Nature 505, 502, 2014). If this is also true for HIV—and preliminary results suggest it is—it could explain why candidate HIV vaccines have so far shown no or only low efficacy in human trials: they failed to induce antibodies to this resistant form of Envelope. “It probably can explain why RV144 worked a little bit but not a lot,” says Oregon Health & Science University researcher Louis Picker, who was not involved in the study, referring to RV144, the only human trial to date that showed some, albeit low, efficacy of an HIV candidate vaccine of 31.2%. The new findings come from experiments where the researchers, led by Mario Roederer of the Vaccine Research Center in Bethesda, Md., gave rhesus macaques different types of experimental vaccines that contained certain parts of SIV. Only one of them, a vaccine that contained only the SIV Envelope protein, protected the animals: it reduced the probability of infection after each SIV exposure threefold. But some of the animals still got infected—even though they had received the vaccine. When the researchers took a closer look at what might have enabled viruses to break through the vaccine protection, they found a tiny change in their Envelope protein: two amino acids (the building blocks of proteins) called alanine (A) and lysine (K) were in certain positions close to one end of the Env protein that are usually occupied by two different amino acids called threonine and arginine. That’s a small difference, given that the entire Envelope protein is more then 850 amino acids long. But later experiments showed that the difference was enough to make half of these “A/K” viruses resistant to the antibodies in the blood of the vaccinated animals. The researchers calculated that for this to happen, only a tiny fraction—about 2%—of the A/K Envelope proteins must have become resistant to the antibodies, because each virus carries many Env proteins on its surface, and just one of them needs to be antibody resistant to infect a target cell. Why the different amino acids made only a tiny fraction of Envelope proteins resistant to antibody binding is unclear. But the researchers speculate that they somehow allowed the Envelope to sometimes fold into a different shape, which made it more difficult for antibodies to bind to most parts of it. To better understand how this works, the researchers now plan to isolate the resistant A/K form of the SIV Envelope protein and study its structure. But the fact that the resistant A/K Envelope form is so rare could make this quite difficult—and is probably the reason why the resistant form has so far escaped the attention of researchers. Isolating the resistant form would also enable researchers to create structures that mimic it to develop a vaccine that can induce antibodies to resistant virus variants. “If we could purify that form, or figure out how to stabilize it in some way and make it in large quantities, we could immunize with it,” Roederer says. To be sure, the A/K change doesn’t seem to make all parts of Envelope resistant to antibody binding. One part of Envelope that the virus uses to bind to a target cell protein called CD4 when it enters target cells seems to be unaffected, because the researchers found that antibody-like molecules that resemble CD4 could still bind the resistant A/K form of Envelope. Therefore, another way to make a vaccine that protects from the resistant A/K viruses is to make sure that the vaccine induces CD4-specific bNAbs, such as one called VRC01. “If we figure out an immunogen that elicits VRC01 in everyone, then we are done,” Roederer says. What are virus-like particles and how are they being used in the design of AIDS vaccine candidates? Many vaccines teach the body how to fend off a chosen bacterium, virus or parasite by presenting it with a killed or weakened form of that pathogen. These approaches are not, however, viable for HIV due to concerns that any such virus preparation may not be completely inactivated, or that its weakened form might mutate and regain its ability to cause disease. So scientists have relied instead on delivering purified proteins derived from recombinant HIV genes, or the genes themselves, to trigger cellular (T-cell) and antibody (B-cell) responses against HIV (see VAX July 2008 Special Issue, Understanding the Immune System and AIDS Vaccine Strategies). AIDS researchers have tended to favor recombinant vaccines, in which parts of the pathogen are synthesized from scratch and used as immunogens (the active ingredient in the vaccine candidate). In some cases, the vaccine candidates have consisted of soluble proteins, which, as the phrase suggests, dissolve easily in water. This is the approach that was used in one vaccine candidate used in the RV144 trial (see VAX Sep. 2009 Spotlight article, First Evidence of Efficacy from Large-Scale HIV Vaccine Trial), which demonstrated modest efficacy, and the candidate used in the Step trial (see VAX Oct.-Nov. 2007 Spotlight article, A STEP Back? ), which did not. Another type of recombinant vaccine that has captured the attention of scientists in recent years relies on virus-like particles (VLPs) to deliver HIV’s payload. While VLP vaccine candidates present their own challenges, these multi-protein structures have yielded impressive results in studies and represent a safe and potentially more effective alternative for HIV vaccines. Studies suggest that VLP vaccines against the influenza virus might be able to provide more potent and longer-lasting protection than do the current seasonal vaccines. AIDS researchers are developing VLP-based vaccines as well. A variety of VLPs are currently in various stages of pre-clinical and clinical development. So how do these candidates work? As you may know, viruses need a human host to multiply. A virus particle—or virion—is essentially a combination of DNA or RNA material packaged in a protein capsule that’s made by infected cells and spreads by budding. A number of years ago, researchers described during their study of the hepatitis B virus that it’s possible to assemble particles that lack a viral genome and some of its proteins, but can still be recognized by the immune system. VLPs present parts of the proteins specific to the targeted pathogen, such as the Envelope (see VAX March 2011 Primer on Understanding HIV’s Envelope Protein) that sits on HIV’s surface and is used by the virus to invade cells. VLPs are similar in size and conformation to intact virions. Because they lack crucial genetic material, they are non-infectious and so provide a safer alternative to weakened viruses. Many VLP vaccine candidates are also built from viruses that infect bacteria, or those that infect plants, animals, or even humans. Studies have found that VLP vaccine candidates can be highly immunogenic, in part because they can display multiple antigens on their surface, improving interaction with components of the immune system and thus increasing the odds of inducing a potent antibody response. AIDS vaccine researchers are employing VLPs in different ways. One group of researchers is using them to induce antibodies to a part of the protein spike that protrudes from HIV’s Envelope called the membrane proximal external region. This part of the spike is important for fusion of the viral membrane with the target cell membrane. Researchers are using a baculovirus—which infects cultured insect cells—to express the recombinant HIV genes. The VLPs are then purified from infected cells. Researchers have also created a VLP vaccine candidate that swapped one segment of HIV’s spike—another name for the Envelope, or trimer—with a smaller protein from the influenza virus. 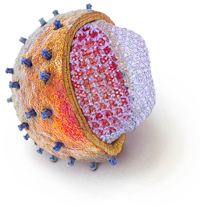 They devised this method to try and make portions of the HIV spike more accessible to the human immune system. Finally, researchers have developed a test that uses VLPs to screen for proteins that bind to the earliest ancestors of broadly neutralizing antibodies (bNAbs), which prevent a broad variety of HIV variants from invading cells in laboratory studies. Scientists have identified dozens of these bNAbs in people with chronic HIV, but the antibodies take years to develop. So engaging these early cells, known as germ-line precursors, represents a potential road to success in developing a vaccine candidate that might induce these coveted bNAbs (see VAX May 2013 Primer onUnderstanding How a Vaccine May be Designed to Induce Broadly Neutralizing Antibodies). While VLP vaccine candidates are an attractive alternative, they present manufacturing challenges that developers will need to overcome. Some VLP candidates are too costly to produce in significant quantities and the biological structures of some VLPs are, in some cases, too complicated for large-scale production. Still, there are now two recombinant vaccines on the market—one for hepatitis B and the other for human papilloma virus—that employ VLP platforms. Another VLP-based vaccine candidate, GlaxoSmithKline’s malaria vaccine candidate RTS,S, is in late-stage clinical testing (see VAX Nov. 2012 Global News). The hope is that VLPs may help AIDS vaccine scientists achieve similar success.